A idea worthy of being analyzed and studied, after all, is not every day we found a business recommended by big names in the forum bitcointalk, so some investment should be carried out and as mentioned above there is a tendency to replace the BTC here in the forum. In conclusion, leaving the optimism aside, we should look seriously at the plan proposal, understand the meaning and only then sit back and wait to go to the moon. 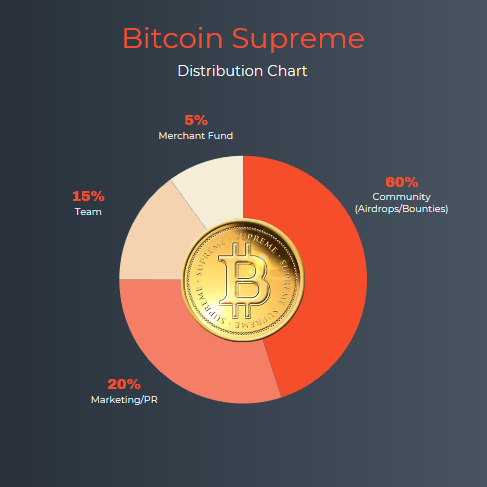 Bitcoin Supreme is a new digital currency that is focusing on solving the current issues of Bitcoin, the most in-demand cryptocurrency on the market. While Bitcoin has been doing fairly well at altering the way the world thinks about currency, it has been having many issues including high fees, transaction delays, political issues and more. ​Bitcoin Supreme will be decentralized, secure, lightning fast and cost effective. Bitcoin Supreme (BTCS) are planning on adding onto multiple exchanges, goal is to have it listed on as many exchanges as possible, especially high vol exchanges. Once BTCS is updated a bit more with upcoming news and updates (see roadmap) in addition to being listed on other exchanges with decent volume, you should see it getting listed on more exchanges, including (but not limited to) the ones informed. BTCS has some similarities to BTC and has been developed from scratch. Everyone will be given coins for free through airdrops and bounties. You do not need to have BTC to receive BTCS, this way it will be easier to welcome new people into cryptocurrencies. NOTE: BTCS will split the bonus into 4 weeks (25% per week = 100%) must send a screenshot each week.